I used to love rum balls growing up. I don’t know how much rum was in them but I do know they were made with corn syrup and confectioner’s sugar, not two particularly healthy ingredients. By creating healthier alternatives to your favourite Christmas desserts, there’s no need to go overboard during the holidays. 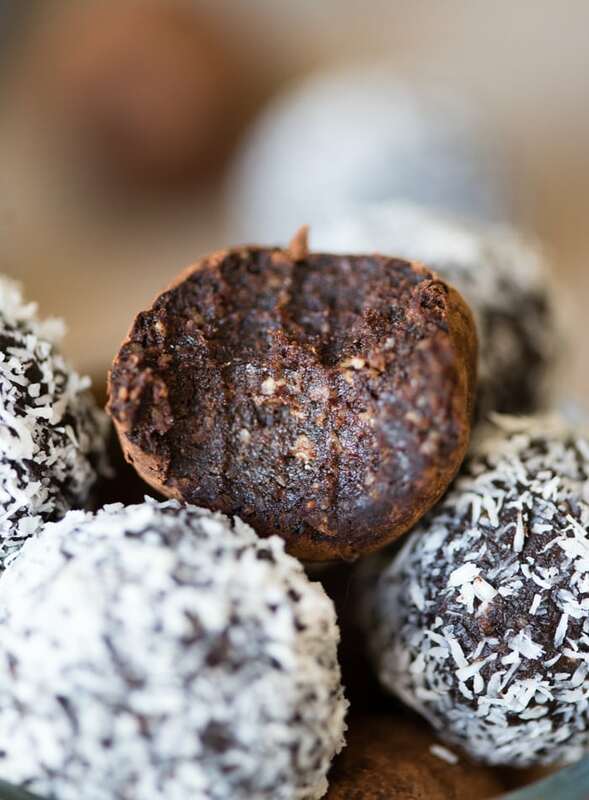 These vegan rum balls are made with cacao powder, dates, nuts, almond butter, maple syrup and dark chocolate for a healthier take on classic rum balls. 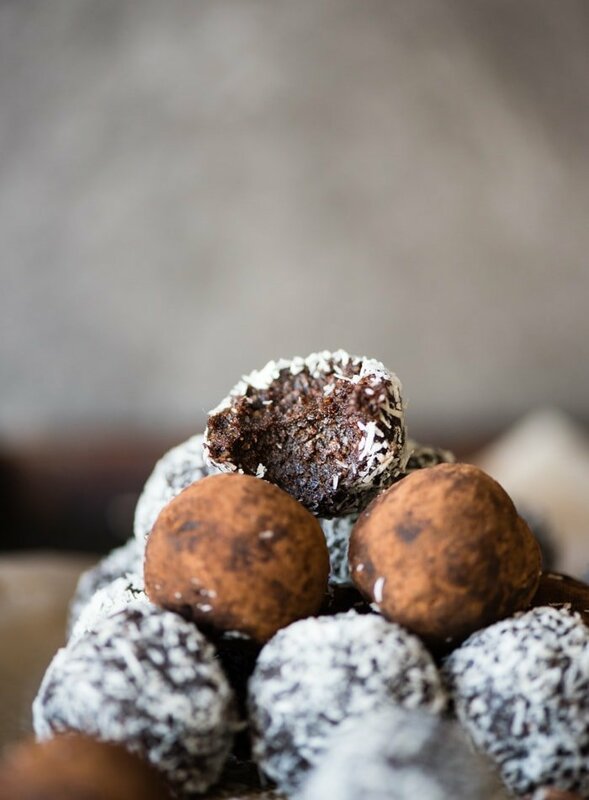 Traditional rum balls are made with vanilla wafers, cocoa powder, icing, corn syrup, nuts and rum. 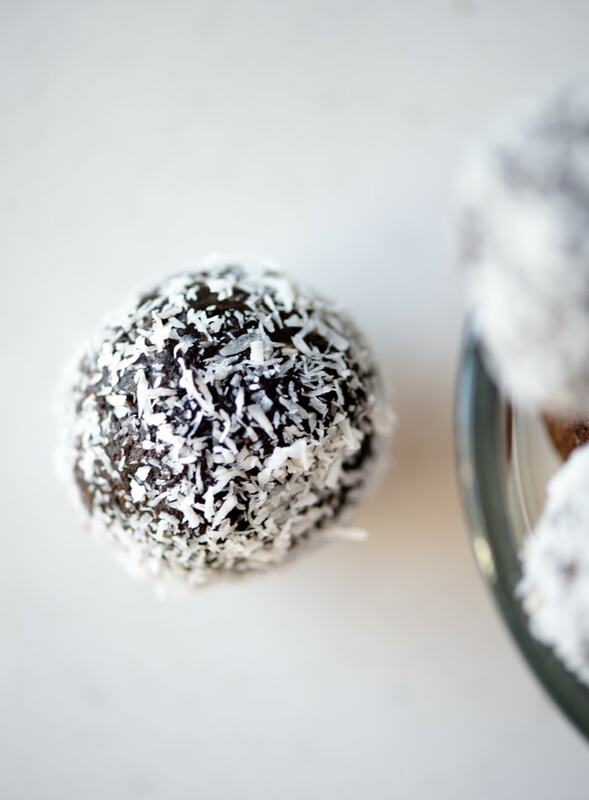 Here are the swaps I made to create healthier vegan rum balls. Pecans instead of vanilla wafers. I used ground pecans instead of vanilla wafers. You’ll want to process your nuts into a flour to mimic the consistency of crushed wafers. I also added 1 tsp of vanilla extract for the vanilla flavour. Cacao powder instead of cocoa powder. You can you either of these ingredients but I used raw cacao for it’s nutritional benefits. Dates and maple syrup instead of icing sugar and corn syrup. Instead of icing sugar, I used dates to sweeten these and I used a bit of pure maple syrup instead of highly processed corn syrup. Almond butter. I added a bit of almond butter for extra creaminess and richness. Melted dark chocolate. I added melted dark chocolate for richness, chocolate flavour, creaminess and a firm but soft, truffle-like texture. I hope you guys enjoy this twist on classic rum balls. These aren’t super sweet but they are rich and decadent with a subtle hint of rum flavour. To make them sweeter, you could use dairy-free chocolate chips instead of dark chocolate. As for the nuts, you can use pecans like I did, or a mixture of pecans and another nut such as almonds or hazelnuts. You can also make them with just almonds. I wouldn’t recommend cashews as they’re a bit too soft to blend into flour. 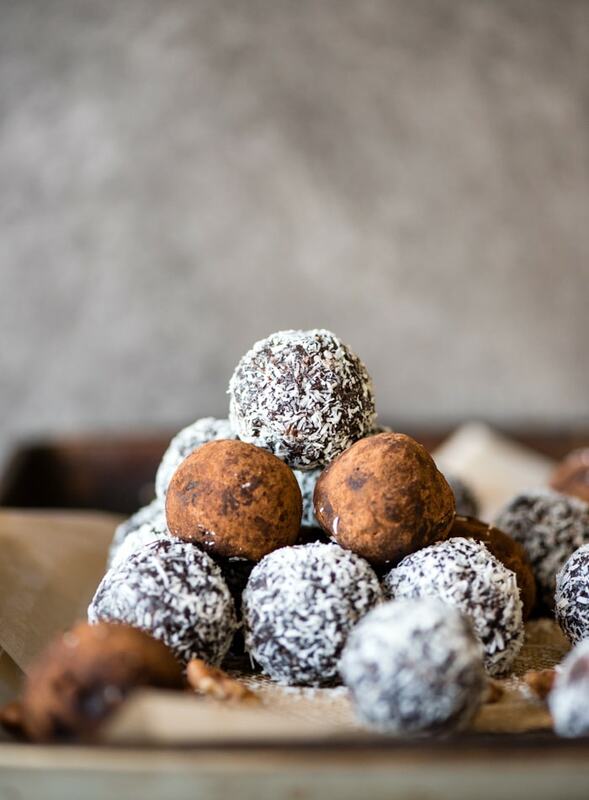 You can leave your rum balls plain or coat them in cacao powder, coconut, coconut sugar, cinnamom or vegan chocolate sprinkles. I loved them with cocoa powder and coconut. I could only find imitation rum extract to make these and it didn’t have that strong of flavour.Even with 2 1/2 tbsp of the rum extract I used the flavour was is still very subtle. If you can find some natural rum essence (also called flavour or extract), use that but start with 1 tbsp then add more to taste if desired. If you prefer, you can use dark rum instead of rum extract. Start with 2 tbsp and adjust to taste. If the dough seems to sticky and wet, add a bit of extra cacao powder. After these sit in the freezer for a couple hours and the chocolate hardens, they’re insane. 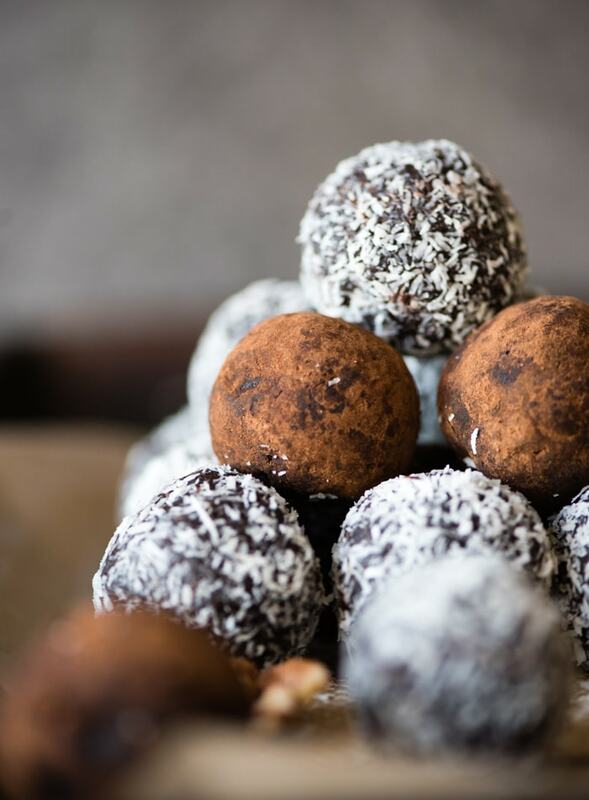 The texture is almost like a truffle: firm but soft so they melt in your mouth. I would recommend storing them in the freezer until right before serving however once they harden up in the freezer, you can transfer them to the fridge. They’re delicious either way. Place the pecans in a food processor or high-powered blender and process until they form a fine flour. Add the dates, rum extract, cacao powder and vanilla extract and mix to combine. Melt the dark chocolate, almond butter and maple syrup together in the microwave or in a small saucepan on the stovetop until smooth then pour over the rest of the ingredients. Process until it forms a thick dough. Roll into approximately 22 balls (if it’s too sticky, place the dough in the fridge for 20 minutes before rolling). 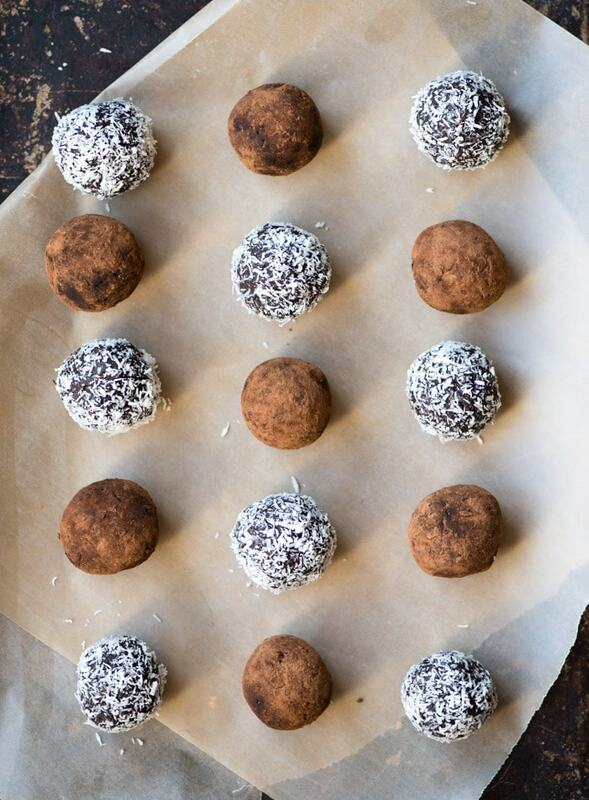 Roll the balls in shredded coconut or cacao powder, if desired. Place in the freezer for 3 hours to set. Serve or store in the fridge for up to 1 week or freezer for up to 3 months. I like them straight from the freezer best. I could only find imitation rum extract in my local store and it required quite a bit to get the rum flavour to come through. Natural rum flavour (also called essence or extract) would be preferable as it has a much stronger, richer flavour. If you’re using natural rum extract, start with 1 tbsp and add more to taste. If you prefer, you can use dark rum instead of rum extract. Start with 2 tbsp and add more to taste. If the dough becomes too wet, add extra cocoa powder. To make these sweeter, use dairy-free chocolate chips instead of dark chocolate. It’s important to use soft, fresh dates in no-bake recipes. If your dates are hard and dry, soak them in hot water for 15 minutes and drain well before using. It’s not necessary to refrigerate the dough before rolling but I found it to be less messy and sticky if I let it firm up a bit first. How much flour do the processed nuts amount to? I have almond flour but I’m not sure how much to use.